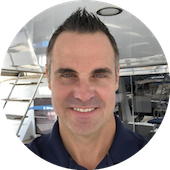 Hurricane season is right around the corner and if you’re a boat owner anxiety starts building, particularly a catamaran owner as you may have a harder time protecting her than a normal monohull. Don’t wait until the storm is imminent to start preparations. Have a plan and activate it early before the condition worsens to the point that it becomes unsafe to tackle. Some of the challenges are dockage with respect to marinas. Besides the draft issue, you need a wide berth to hold a catamarans beam. Most marinas are set up for monohull boats with an average beam of 10 to 15 feet. With a catamaran, you have a beam somewhere between 22 and 28 depending on the model. As a catamaran owner, your best bet is a face dock but those are few and far between. Try and scope out a location behind a home/residence with a concrete face dock. Now that you found a dock let’s run through the list of other challenges that need to be dealt with. When you set up your dock lines with the normal bow, stern and springs you should always double all those lines. Just as important is chafe gear/guards. Most people use store bought chafe gear but I recommend visiting a neighborhood fire station and asking for an old section or damaged piece of fire hose, roughly 25 feet of small diameter hose. Working as a firefighter in the past and using a piece of fire hose for this exact scenario, it has proven to be the best option if possible. Use the hose on both points of contact, the boat, and dock. There isn’t any better chafe protection in my book. A good idea is to put a bow and a stern anchor out into the channel so you can ease the boat off the dock. This will help to minimize the boat slapping the dock. Another good idea in addition to your normal fenders is to add fender boards in front of each piling. Removing sails from a catamaran has its own challenges. It is defiantly a two-person job. The main is usually fully battened and the sail slides on a car system that needs to be taken apart piece by piece. After that’s completed we move onto the roller furling. That needs to be completely unfurled and then the halyard is lowered and stowed. Also, remove any light wind sail that may be on a continuous furler and stow that as well. The next step is any canvas that can be removed should be removed, period. If the winds pick up enough it will shed anything left behind. Bolted objects like solar panels that can be easily removed should be done as well. Secure your halyards to keep them from banging the mast in high winds as well. Everyone that owns a boat in an area that has the likelihood of getting a hurricane should be prepared.